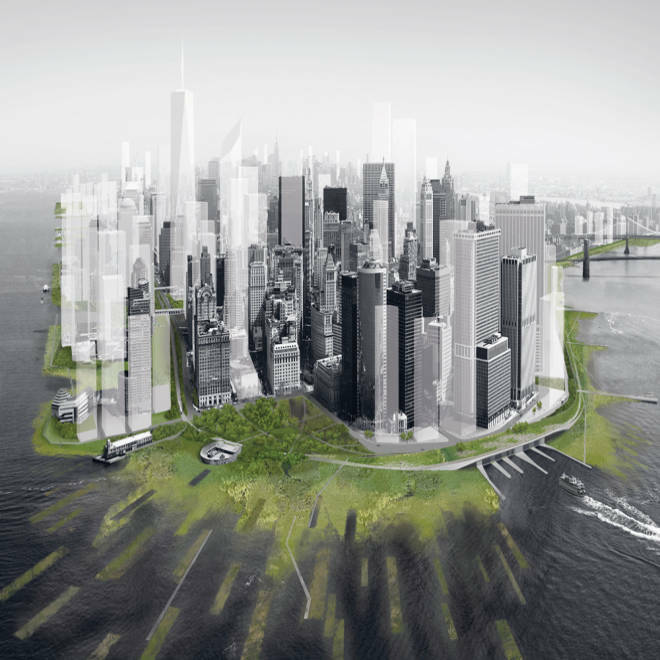 Architecture Research Office (ARO) – Proposed "greening" of Lower Manhattan. Parks and freshwater and saltwater wetlands create new ecosystems, facilitating greater ecological connectivity, improving water quality, and enhancing opportunities for habitat growth. The killer storm that hit the East Coast last month and left the nation's largest city with a crippled transit system, widespread power outages and severe flooding has resurfaced the debate about how best to protect a city like New York against rising storm surges. At a news conference the day after superstorm Sandy made landfall, New York Gov. Andrew Cuomo said the city must plan and prepare for the reality of extreme weather patterns in the future. "There has been a series of extreme weather incidents," Cuomo said Oct. 30. "That is not a political statement. That is a factual statement. Anyone who says there's not a dramatic change in weather patterns, I think is denying reality." Before the storm, Mayor Michael Bloomberg's administration had said it was working to analyze natural risks and the effectiveness of various coast-protection techniques, including storm-surge barriers. In a 2011 report called "Vision 2020: New York City Comprehensive Waterfront Plan," NYC's Department of City Planning listed restoring degraded natural waterfront areas, protecting wetlands and building seawalls as some of the strategies to increase the city’s resilience to climate change and sea level rise. "Hurricane Sandy is a wake-up call to all of us in this city and on Long Island," Malcolm Bowman, professor of physical oceanography at State University of New York at Stony Brook, told NBC News' Richard Engel. "That means designing and building storm-surge barriers like many cities in Europe already have." 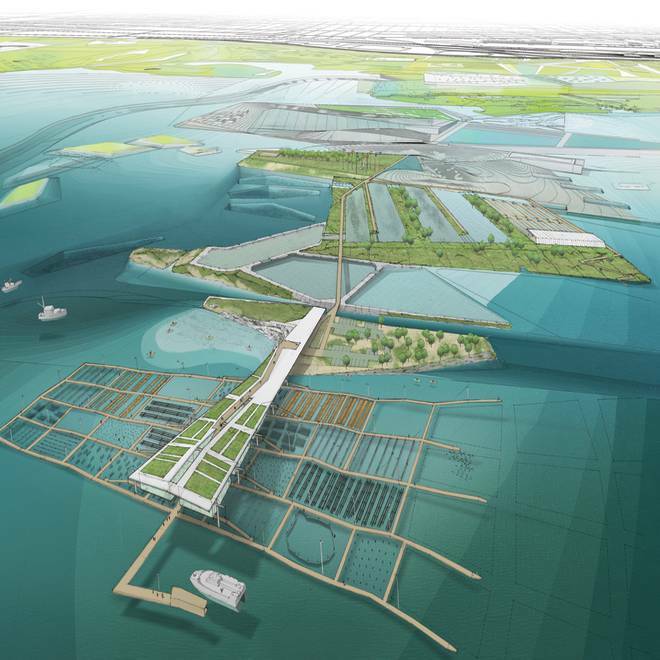 Bowman points to storm surge barrier projects in St. Petersburg, Russia, and in the Netherlands as models. In the Netherlands, a country where a considerable part of the population lives below sea level, such barriers help control flooding in some of the most densely populated areas. 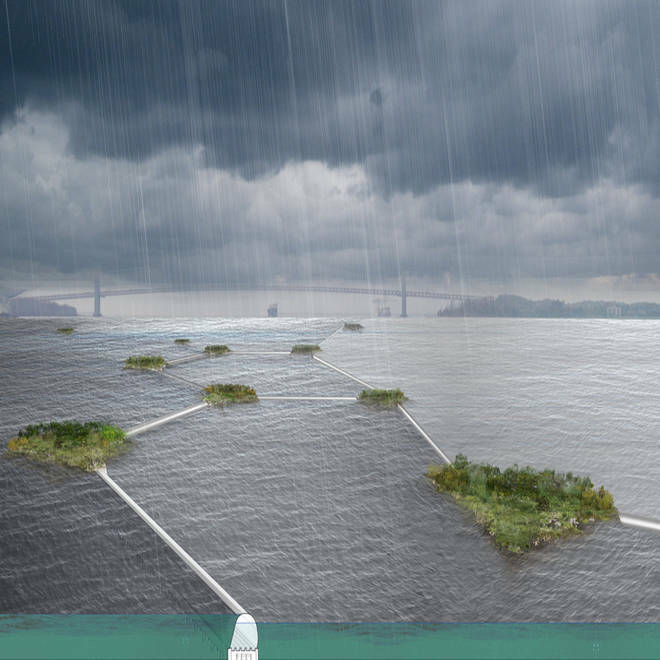 Oyster-tecture implemented in the Bay Ridge Flats area, with reef, floating paths, anchorage areas for oyster harvesting, and constructed islands. "If we had such barriers in place during Hurricane Sandy there would have been no damage at all," Bowman said. But before Sandy and even before 2011's Hurricane Irene pummeled the New York area, a 2010 exhibition called "Rising Currents: Projects for New York’s Waterfront" at the Museum of Modern Art brought together five teams to re-envision the coastlines around New York Harbor and to offer creative solutions to address the rising water levels. Organizer Barry Bergdoll, The Philip Johnson Chief Curator of Architecture and Design at MoMA, told NBC News that when Sandy hit, the images and ideas from Rising Currents came roaring back. Bergdoll said he was pleased people remembered the exhibition, "but obviously not so pleased with people saying, ‘Wow, you know, you guys predicted this and then nothing was done.’"
“I don’t like to be suddenly typecast as the Cassandra of architecture," he added. 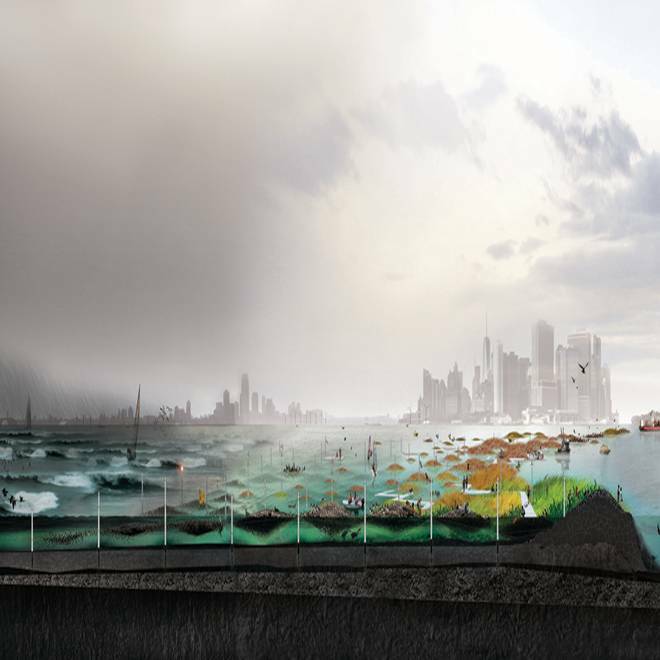 Bergdoll said a seawall and the proposals presented in the exhibition, which included artificial islands, reefs and ways to make the surfaces of the city more absorptive, are not mutually exclusive. New Aqueous City: Storm barriers between man-made islands are inflated when storm surge flooding occurs. “The Stony Brook people are right to look to the Netherlands, but I wouldn’t look to the Netherlands simply because they have a seawall; they also built intelligently for knowing that their flooding is frequent," he said. “The designers and the innovative thinkers need to be involved in the thinking of these issues now, rather than having them solved by politicians and engineers, and then letting them be designed by others." Sandy, a category 1 hurricane, sent a record 14-foot storm surge into New York Harbor and flooded subway tunnels and airports. It forced the closure of the stock market for two days, the first time that's happened for weather-related reasons since 1888. The Rising Currents projects were modeled for a category 3 storm, Bergdoll said. The Acquaculture Research and Development Center consists of a series of laboratories and testing beds. The second floor and roof are stable, but the floating docks rise and fall with the tide, allowing for controlled testing of aquatic species in the estuarine environment of the harbor. Studies at the ARDC focus on the interdependencies of farmed species with the goal of developing a balanced and environmentally beneficial cultivation of the harbor. Artificial islands or reefs (including ones made of recycled glass) to make the shoreline more absorptive and break the waves. “You need to plan assuming that [Sandy] is not a one-time event," Bergdoll said. “What is really needed, I think, is a combination of the large-scale gestures and then the incremental ones," he said, adding that the city's building codes should be re-examined. City administrators were involved in the exhibition, Bergdoll said, and they took it "very, very seriously," but he said it's worrisome that Sandy happened in the twilight of an administration that will be gone next year. Rising Currents continues to live online, and Bergdoll said the next step would be to put a price tag on the different proposals. “I think what’s really needed is to figure out how to make it as a bridge from a hypothetical study to something that could become a plan of action," he said. NBC News' Richard Engel investigates what experts say can be done to better protect coastal cities from storms like Sandy. Sandy sent a record 14-foot storm surge into New York Harbor, flooding subway tunnels and airports.